While 3G is still in its infancy stage in India, BSNL yesterday moved to the 4th generation technology by launching WiMax at Cochin area Kerala. Those who don’t have the provision to take wired BSNL connection can opt for BSNL WiMax. The easy to access WiMax technology provides high wireless broadband at customer premises. The BSNL WiMax network is capable of providing internet speed around 33 mbps. At initial phase, BSNL WiMax users in Cochin will get to speed up to 2 mbps, which will be later upgraded to higher speeds. 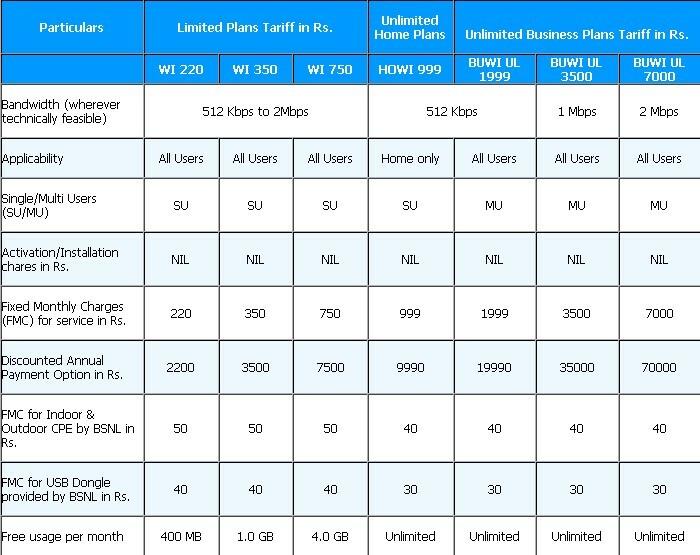 BSNL has announced attractive tariff plans as a part of the launch. Over usage in all plans will be charged at .80 Rs per MB download or upload. One time security deposit for WiMax equal to FMC ( Fixed Monthly Charge) will be collected in next billing cycle. The minimum hire period of the service is 1 month for unlimited business and home WiMax plans, and one month for limited plans. BSNL aims to construct around 1000 WiMax base station. Like the proposed 3G roll-out, the WiMax service will be available first at the district centers and other important cities. BSNL would provide complete 3G and WiMax coverage by the end of 2010. 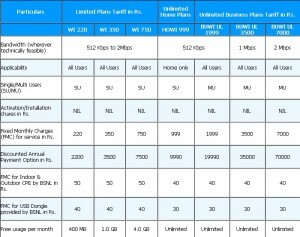 The latest BSNL WiMax plans targets both home and business users. Both types of users have the option to choose unlimited WiMax internet, other than usage based tariff. For accessing WiMax, users need to purchase internal and external WiMax CPEs and USB dongle. Both are available at BSNL for purchase or monthly rent. Laptops and netbooks with WiMax adapter can also access the services. Tata Indicom (VSNL) and Reliance WiMax services are available at different cities in India. However, most private providers don’t have unlimited WiMax plans, and their coverage is too limited. All were waiting for BSNL to launch commercial cost effective WiMax plans with coverage. We hope that BSNL would establish the WiMax coverage in more cities incoming few months. available from malappurum,yes or no. please sent this qustons answer. wi max in all districts in kerala. For HOME users 750 unlimited plan with speed 2 Mbps . Wow . 2mbps unlimite broadband @750 from BSNL . Why we use other slow speed internet ,normally 210kbps @ 550rs ? Constant speed . No network problem . Super Wi-Max…. Wwooooo..that’s gr8..when bsnl will launch Wimax in uttar pradesh. bsnl wimax is really superb. for unlimited plan of rs.750 iam getting an average download speed of 190kbps. does this wimax facility available to navagarh salkhan village area….we need broad band in govt hoapital here….what is another way to access..